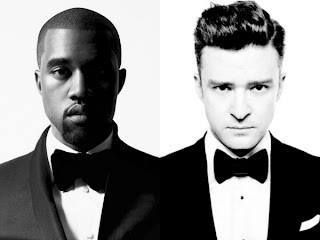 Seems Kanye West is not the only one that is not afraid to court controversy as Justin Timberlake while performing on SNL (Saturday Night Live) throws a jab back at Kanye West. Mr. JT let's one at Kanye by singing, "my hit's so sick got RAPPERS acting dramatic" instead of the original "Aww, s**t so sick, got a hit and picked up a habit" . This could be translated to go f*ck yourself, Kanye West. Kanye West had earlier spoken about how he disliked liked the Suit & Tie record, saying "I got love for Hov, but I ain't f--king with that 'Suit & Tie."